Your kid takes doing the right thing to a whole new level. He started a squad of kids to protect the smaller kids at school. It all started one day when he saw Ruddy from down the street getting picked on in the cafeteria, your kid got up in the face of the bully, telling him to back down or suffer the consequences of his actions. But really maybe it all started when you enrolled him in Miyagi-san Karate classes. He took the things his sensei said seriously. And you couldn’t be more proud. Your little man is such a good person, and he just wants everyone to be safe and happy. So, when you found out he was using his ninja skills for good, you knew he needed a little surprise. He needed to look the part of the good ninja. 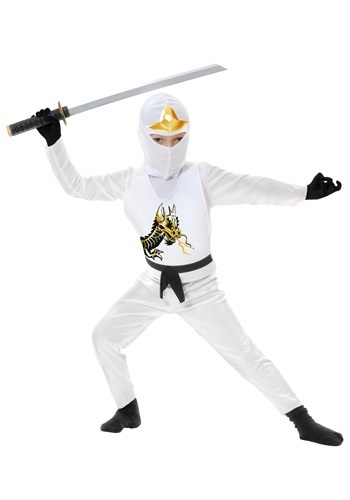 This Child Ninja Avengers Series II White Costume is perfect for his cause. He will be able to keep standing up for the little guy, the people who can’t stand up for themselves, and he will be able to do it in style. The gold dragon printed on the vest will quickly become the symbol of justice. All the nerdy kids in school will rally around him and his squad. While the bullies will see his pure soul reflect in this white ninja costume, and they will know that he will show them the consequences of their actions if they pick on anyone ever again! Terrible quality! waste of money! I'm sorry to hear that you weren't happy with the quality of the costume! I wasn't able to find an order under your email address, did you happen to reach out to Customer Service regarding the costume you received? We're always more than willing to help!